The lives of great people are worth reading and encouraging. Autobiography is commonly understood in terms of giving readers an insight into private lives of unique individuals. In other words, it is detailed account of someone’s life. These books serve as an inspirational booster for the youths and for all those who read the Autobiographies. Books have always reminded as man’s best friend. They speak to us and guide us in many critical situations of life. Most of the people choose to read fiction books, story books, novels, etc it is always better to read on either Biographies or Autobiographies. Many think that it is quite boring to read on Autobiographies but they don’t realize that it is trove knowledge and experiences of which can be learnt. 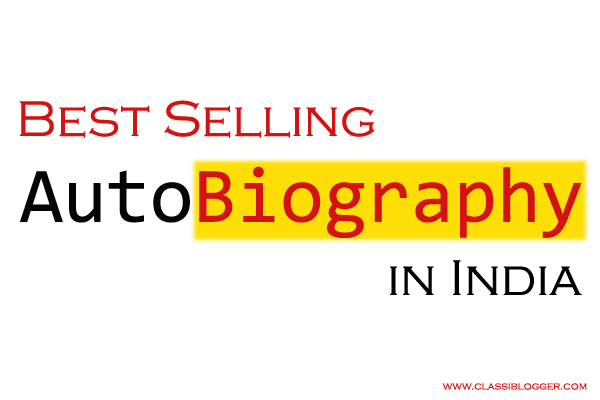 Here, let us check on few important Autobiographies that are best selling in the Indian market. This is a biography by Baru who has observed up close singh’s often troubled relations with his ministers , his cautious equation with Sonia Gandhi and his way of handling all the big crisis from managing the left to pushing through the nuclear deal. Insightful, acute and packed with Political Gossips, Accidental Prime Minister is one of the great insider accounts of Indian Political Life and very good portrait of Manmohan Singh’s era. Wings Of Fire: An Autobiography is a book that documents the life of A. P. J. Abdul Kalam, and inspires the readers to ignite the fire within themselves. Avul Pakir Jainulabdeen Abdul Kalam who was born to a little-educated boat man at Rameswaram, had an unparalled career as a defence scientist, culminating the highest Indian Civilian award, Bharat Ratna. As a chief of Country’s defense research and development program, Kalam demonstrated a great potential for dynamism and innovation that existed in research establishments. Mein Kampf meaning “My Struggle” written by Adolf Hitler by himself. This is one of the most controversial yet most intriguing book of all time. When Hitler first started to dictating this book to his deputy Rudolf Hess, he was imprisoned for what he termed as remorse for his “Political crimes”. This book contains two volumes in which first volume is written during his thirteen months of imprisonment and second volume after his release. It is said that Hitler’s original intent behind writing the book was to fulfill his financial obligations towards his expenses occurred during his trial. This book has been named as one of the best spiritual books of the Twentieth century. This book written by Paramahamsa yogananda shows his remarkable life story which takes you to the world of saints and yogis, science, miracles and resurrection. With soul satisfying wisdom he illuminates the deepest secrets of life and the universe opening our hearts and minds to the beauty of the world. This is a spiritual book which will help you to understand the purpose of life. This is an Autobiography from five-time world Boxing champion Mary Kom. This book talks about the boxing life of India’s leading female boxer Mary Kom. She has mentioned her hard times which she faced to reach this position in her life. This autobiography is all about her childhood days,her rebellions, her love and marriage life. Born in a modest family, Mary Kom had a keen interest to join in athletics right from her childhood. But she did not know that her whole career is going to be boxing until she met an inspirational success from Dingko singh. Mary kom intented to inspire millions of women around the world by her true inspirational story. This is a very famous Autobiography written by Sachin Tendulkar. The book starts with his childhood days, his naughtiness, how he was introduced to cricket; the hardships he has to face in his life; numerous practice matches he played week after week. He has also narrated his love at first sight between Sachin and his wife Anjali. The autobiography has shown Sachin in different dimension. A shiver runs down his spine when he talks about the injuries that he had faced during the matches. He has played with broken finger, broken toe or with groin problems. Many of hardest innings are achieved by Sachin in excruciating pain. He pushed himself to do best for the nation. This is an autobiography written by Barrack Obama himself. He was the son of a black African father and a white American mother , Obama was only two years old when his father walked out of their family. Later, he comes to know that his father is dead. This sudden news inspires an emotional odyssey for Obama, determined to learn the truth of his father’s life. This book was written at his age of Thirty-three , Dreams from my father is an unforgettable read. So check out these books and understand what do we get from these biographies? It is nothing but priceless lessons of experience. If you want to excel in your own life, start reading the Autobiographies of all inspirational persons. Good Luck!! Below i listed some important autobiographies for your reference.